Summary: The apostles and the first believers attended the temple worship at the hours of prayer. Peter and John seem to have been led by the Holy Spirit, to perform a miracle on a man who was over forty years old and had been a cripple from his birth. The apostles and the first believers attended the temple worship at the hours of prayer. Peter and John seem to have been led by the Holy Spirit, to perform a miracle on a man who was over forty years old and had been a cripple from his birth. Peter, in the name of Jesus of Nazareth, told him to rise up and walk. Accordingly, if we would attempt the healing of men's souls, we must go forth in the name and power of Jesus Christ, calling on helpless sinners to arise and walk in the way of holiness, by faith in Him. How precious is the thought to our souls that regardless of all the crippled faculties of our fallen nature, the name of Jesus Christ of Nazareth can make us whole! With what holy joy and rapture shall we walk the holy courts, when God the Spirit causes us to enter there by his strength! Peter and John must have had a close friendship, which probably began when they worked side-by-side in the fishing-boats while they pursued their trade as fishermen on the Sea of Galilee. Luke tells us that the sons of Zebedee were "partners with Simon," and helped him to land the miraculous draught of fishes. The account of this miracle is found in Luke 5—“Now when he had left speaking, he said unto Simon, Launch out into the deep, and let down your nets for a draught. And Simon answering said unto him, Master, we have toiled all the night, and have taken nothing: nevertheless at thy word I will let down the net. And when they had this done, they enclosed a great multitude of fishes: and their net brake. And they beckoned unto their partners, which were in the other ship, that they should come and help them. And they came, and filled both the ships, so that they began to sink. When Simon Peter saw it, he fell down at Jesus' knees, saying, Depart from me; for I am a sinful man, O Lord. For he was astonished, and all that were with him, at the draught of the fishes which they had taken: And so was also James, and John, the sons of Zebedee, which were partners with Simon. And Jesus said unto Simon, Fear not; from henceforth thou shalt catch men” (Luke 5:4-10). We find the two sons of Zebedee associated with Peter in the inner circle of the Lord's apostles, at the Transfiguration, at the raising of Jairus' daughter, and at the agony in the Garden of Gethsemane—“And as he sat upon the mount of Olives over against the temple, Peter and James and John and Andrew asked him privately” (Mark 13:3). But the still closer friendship of Peter and John appears first when they go together to the palace of Caiaphas on the night of the Lord’s betrayal—“And Simon Peter followed Jesus, and so did another disciple (John): that disciple was known unto the high priest, and went in with Jesus into the palace of the high priest.” (John 18:15), and then in the memorable visit to the holy sepulcher on the morning of the Resurrection—“Then she runneth, and cometh to Simon Peter, and to the other disciple, whom Jesus loved (John), and saith unto them, They have taken away the Lord out of the sepulcher, and we know not where they have laid him. Peter therefore went forth, and that other disciple, and came to the sepulcher. So they ran both together: and the other disciple did outrun Peter, and came first to the sepulcher” (John 20:2-4). (Also see John 21:7, 20, and 21.). It would seem natural then, in the early chapters of the Acts, that we find Peter and John constantly acting together at the very forefront of the Christian army (Also see Acts 3:3, 11; Acts 4:13, 19; Acts 8:14, 25). 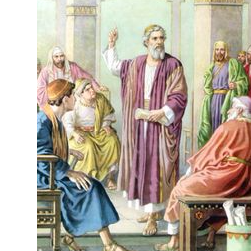 The apostles and the first believers attended the temple worship at the hours of prayer. Peter and John seem to have been led by the Holy Spirit, to perform a miracle on a man who was over forty years old and had been a cripple from his birth.